As we all know guys often make last minute decisions, or if we are being more glass half full, we could say they are being spontaneous! 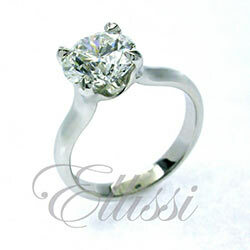 It is for that reason we have decided to put together a range of rings that are ready to wear. These rings can be sent out and be in your hands in most cases within 24 hours, depending on your location. In this range of rings we have selected some of the most popular designs and chosen diamonds that keep the rings in a cost area that is often requested.Any design in this section can be replicated in differing sizes and diamond grades, so if some changes were required to the rings here, all you need to do is send us your request and we can re-quote. More rings will be added in the coming weeks, so remember to check back and bookmark this page. Solitaire 1 ct Radiant Cut with shoulder diamonds.